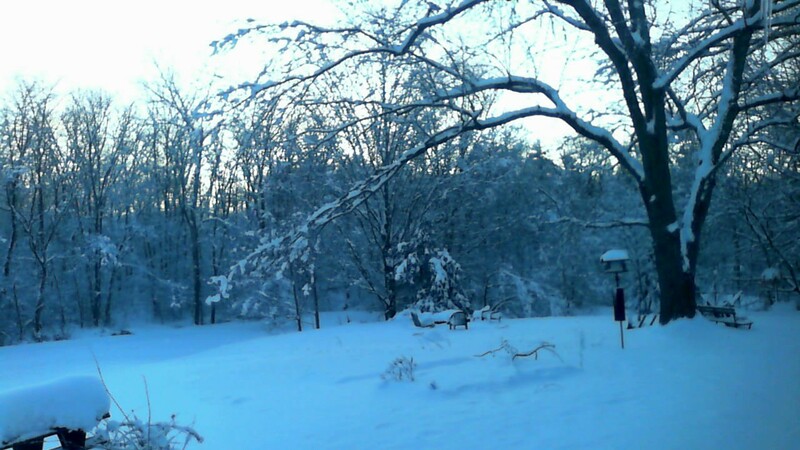 Yesterday 12 inches of snow fell upon us. A few days before that we had 5 inches of snow, so now lay 17 inches of snow in my backyard. It was such a beautiful day yesterday. The wet snow stuck to the trees as the kids and I went sledding and exploring in our woods. The temperature was around 32 degrees, so we bundled up and found ourselves taking off layers during our morning fun. Between fun, Pete and I shoveled the driveway three times as the snow accumulated. As the day continued on, the snow accumulation weighed down tree limbs to the point they would snap and crash to the ground. Panic started to ensue as we looked at our power line and saw a large limb filled with snow, dangling over it. Temperatures began to plummet into the negative numbers. Winterizing our home became necessary because the next two days the weather people are reporting below zero temps. I went to bed last night praying for God to find a way to restore power to the 50,000 people in our metro area that had none, and pleading for Him to allow us to stay safe and warm. I had no control over the scenario. I needed God. This morning as I looked over my yard; the snow that gave us so much joy yesterday was causing intense anxiety today. It looked beautiful, but the weight of it on the trees, powerlines, and rooflines was igniting this huge fear inside of me. I realized that my sins are like this. My selfish sin begins with what seems like so much fun. It is exciting. As I continue to choose myself over God, I continue to make myself believe I deserve this fun. Wouldn’t God want me to have a little joy in life? As I continue down that path, my sin packs on a little more weight. All that fun is getting a little exhausting. A few burdens start popping up all around me. My life still looks pretty joyful and fun, but a few of my choices are weighing on me. Each night I go to sleep and my nights become a little more restless. I begin to worry. I begin to realize maybe I am not making the right choices. My sins encapsulate my body, my mind and finally my soul. I have no control. I need God. Don’t let yourself be fooled by sin. Don’t let yourself be blanketed in your bad choices. Don’t let what seems like fun turn into a trade for your soul. Place God first, not yourself. Let Him be your Light. This entry was posted in Faith, Family, God, Jesus, Religion, Social Justice, Uncategorized, Women and Christianity and tagged burden, God, growth of sin after sin, place God first, sin, Snow, Weight of sin. Bookmark the permalink. I pressed the comment button not knowing how to convey the way your words had ministered to me. As I began to type, the LORD gave me this; Like apples of gold in settings of silver is a word spoken in season. He always uses you to touch me in my “season” of life lately. Thank you! I love that God uses all of us even in our unworthiness! Thank you for that beautiful inspiration! And that is grace in all it’s glorious definition…”In all our unworthiness” he still loves and uses us. How can it be! How incomprehensible. And if forgiveness weren’t enough, He goes further still and calls us his favored ones, his chosen child, and His beloved.